Still Holds Up After A Long Time! Even though it's been a long time since I first watched it, I'm still enjoying this show in 2018! Very solid show, my favorite episode probably has to be episode 49. The show stays true to the manga, which I also enjoyed. Fist of The North Star remains in my top 3 favorite anime to this day! In the future of 199X, everyone is turned into pressurized water balloons, and the man with the strongest fingers is king. But seriously it's Fist of the North Star, the show where a guy name Ken punches dudes and they explode because magi—pressure points. This is a classic anime, probably one of the first that helped to shape the genre of fighting anime. Honestly this show is more about the remains of the world, the oppressed people, and the villains that Ken defeats. Ken is our anchor in the future that is 199X, he shows us the world through a very soft spoken dialect and a bunch of high pitched screams and deep breathing techniques. No monologues from this hero, he quite literally lets his fists do the talking. Does this 1984 anime hold up when viewed 34 years in the future? Yes. It sure does. it's a bit slow going at first, but once the ball really gets rolling it's an entertaining tale of revenge and sacrifice of all the major players. Plus the opening theme for Fist of the North Star 2 is just fantastic. After finishing the 152 episodes (at time of writing) I can't help but feel nostalgia as it wrapped up nicely. Every episode was building up to a climatic end that delivered. Each arc raised the stakes but not too high that it became ridiculous and each punch felt genuine. It was hard to get into at first given its old school style it's not as pretty as some modern anime's but it was quite absorbing after getting used to the style. Each moment and episode felt perfect, even recap episodes had new stuff to add near the end (there's only a few recap episodes don't worry); it was a long journey to the end but every moment was worth the wait. If you want to know where a lot of fighting anime's originated from check this out. You won't be disappointed. One of the greatest shows of all time. Actually the best anime out there. It's a little old, but I have only seen one show that even compares to the greatness of this one. 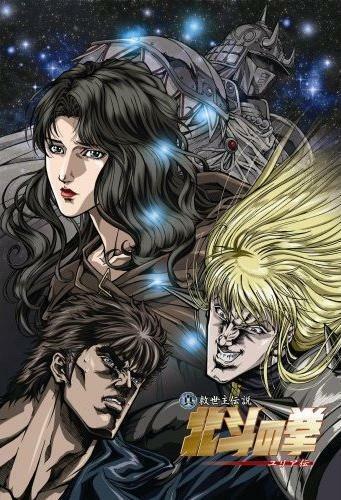 If you haven't seen Hokuto No Ken, you haven't lived. Every episode is action packed and will keep you interested the whole time. It has a great plot along with great action scenes and many touching moments. Very entertaining show where the abundant filler is actually extremely entertaining. I rarely watch long shows but this one got me hooked from start to finish. Kenshiro's way of giving everyone a fighting chance and demonstrate his power against the enemies' strongest techniques makes this show unique. Several action based anime use elements from HnK and watching this makes you understand why. If you like action and well-animated fighting scenes, it doesn't get much better than this. The Bruce Lee in anime! Fist of the North Star was and still is my number one favorite anime and manga series, and also the huge inspiration for my day to day life and long term goal. This manly series inspire many series from Jojo Bizarre and Sakigake Otokojuku in terms of art style and main character design and story theme to Kim Kaphwan character using high pitch "Atatata" cry every time he use his trademark super that is Hou ou Kyaku and has been the staple ever since then. The story are not to be underestimated because of the overview as there are more to this than the so called "Finding Yuria and facing Nanto", it can ranging from facing the inevitable death to villains showing reasonable backstory and taking their action and goal seriously. And once the characters die, they stay dead, with very few exception, much like Fire Emblem in classic, which unlike most shonen series, is something that is hard to pull off and this is the excellent example of how to execute properly. I highly recommend this show, it may not be for everyone, but this is the one that cannot be missed for those who are wondering what inspire Jojo in the first place fist barrage and manly traits wise. A blast up to the final fight with raoh, but after raohs death, its kind of a "whatever"
still, lots of material till then and lots of fun. Far less girly and childish than much of modern anime. Not much more to say on it but that. please enjoy. It's a very old piece of anime, but frankly if you love martial-art themed anime, you just can't ignore this one. Great epic adventure based and outrageously good hand-to-hand combat in a post appocaliptic world. Ken will fight against giants of epic proportions and/or against fierce martial-art techniques. Just try it ! I didn't exactly know what I was getting into when I decided to start watching it in January. At first I was a little confused, and although the middle of the first season and beginning of the second season dragged I was hooked on this crazy action filled adventure. And from the middle of season two onward I was enthralled with this world, the characters and the action. Although the very final season wasn't great, and in fact retconned a few things that irked me, I still enjoyed the experience and was screaming lyrics at the top of my lungs come the finale. All in all it is an excellent experience that, despite it's age, manages to captivate all the way through to the end.